Equipped with an IE browser inside, ImTOO Online Video Downloader for Mac allows you to logon nearly 9 online video sites directly and watch interested online videos easily. These online video sites includes YouTube, Metacafe, Break and Blip. Support downloading online HD videos in resolution of 1080P or 720P as well. Download online videos you are interested in to Mac just by right click, fast and easy. Top rated online video websites are available, including YouTube, Metacafe, Break and Blip. With embedded IE browser, the Online Video Downloader Mac allows you to logon the sites directly, look through freely and watch online videos with ease. Initiate new downloadings by giving the correct URL of the videos, easy and efficient. Switch between online video sites easily, click on the site’s logo or choose from the dropdown sites list. Provides thumbnail view mode on the task list, show thumbnail picture, URL, path and file size of the files. Proxy server configuration is enabled for you to reset the network settings, HTTP type and SOCKS 5 type are available. Batch downloading is offered as well to make the downloading tasks done in efficiency. 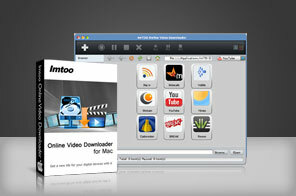 Download and convert online videos from 9 top rated online video websites on Mac OS.